Following the uncertainty caused by extreme weather seen throughout the southern United States, Moran’s was cautiously optimistic heading into their September 12th Traditional Collector auction; thankfully, the excellent selection of property featured in the catalogue brought out the buyers from all over the country, who cast bids online, by telephone and in person throughout the three-and-a-half hour event. The sale achieved a respectable sell-through rate of 75% overall. French clocks in particular saw intense bidder competition; the two highest-grossing lots of the evening were monumentally scaled mantel clock and garniture sets consigned from private Southern California collections. A three-piece Louis XVI-style gilt-bronze mantel clock and garniture by 19th century Parisian maker Charpentier & Compagnie comprising a clock and pair of candelabra was brought to the block with a $30,000 to $40,000 estimate. Consigned from a private Beverly Hills, CA collection, each piece in the set features well-modeled winged putti-form bases and inspired multiple telephone and absentee bidders to vie for the lot; a telephone bidder proved successful, paying $36,000 in all (including Moran’s 20% house buyer’s premium). Assigned a $20,000 to $30,000 pre-sale estimate, a Japy Freres et Cie Louis XVI-style mantel clock and garniture, this example also featuring putti figures modeled in the round, found a buyer for a very respectable $24,000. 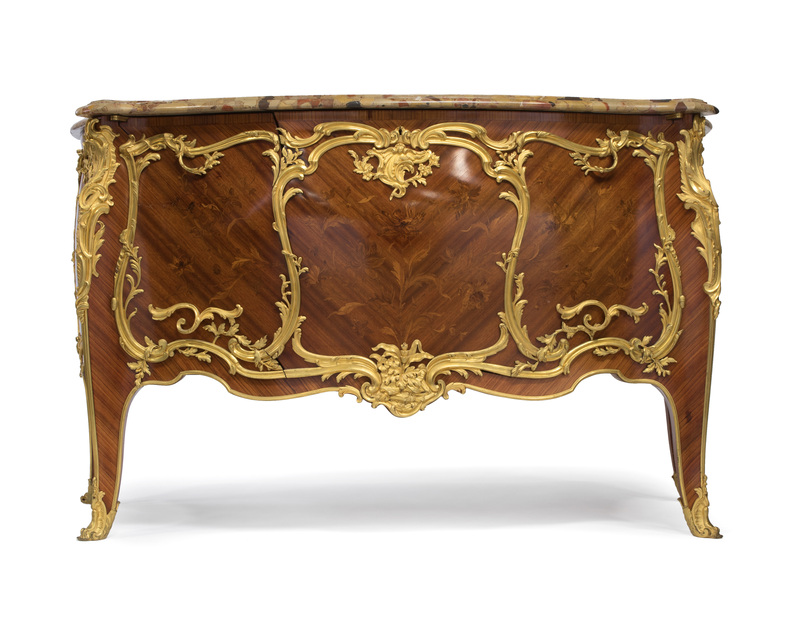 Select pieces of well-made French furniture earned exceptional prices at Moran’s September auction; a Louis XV-style kingwood and satinwood gilt bronze-mounted commode by Parisian cabinetmaker François Linke consigned from a private Los Angeles collection inspired competition between a host of bidders participating from the floor, online and via left bid; after some back and forth, the commode earned a price realized of $22,800 (estimate: $20,000 to $30,000). A hard-to-find gilt-bronze mahogany bed frame in the Louis XVI style was offered with a conservative $3000 to $4000 estimate; thanks to the rarity of its size and the quality of its craftsmanship, the bed achieved an exceptional $11,250 price realized thanks to multiple participants casting their bids via the Liveauctioneers platform. Large-scale decorative object of many kinds were decidedly in favor throughout the evening; a remarkable figurative gilt bronze torchière base, modeled in the form of a courting couple and raised on a faux marble base was presented with a $3000 to $5000 estimate. After a number of fruitless searches for a signature on the well-modeled piece, Moran’s was unable to attribute the piece to a maker; despite this, the single torchière achieved a stunning $9600 selling price. Shortly after, a large-scale Dutch silver epergne dating to 1873 captured the attention of the crowd; telephone lines were full for bidding on the lot, which featured three tiers of cut-crystal bowls and finely rendered silver flowers and foliage (price realized: $6875; estimate: $4000 to $6000). Measuring nearly three feet tall, a pair of silvered bronze putti-motif candelabra was expected to bring between $4000 and $6000; enthusiastic floor bidders pushed the final selling price up to $6600. One dark horse highlight for the evening came in the form of two very large crystal chandeliers consigned from a Beverly Hills collection; featuring a widening frame adorned with fruit and leaf-form drops of clear and variously colored crystal, the handsome pair was sold for $11,400, just within the $10,000 to $15,000 pre-sale estimate. Select Chinese objects did well at the block, including an intriguing and sumptuously carved hardwood figure of Guanyin riding on the back of a spotted deer. Despite some condition issues, the antique carving was popular with floor bidders, selling for $1200 (estimate: $400 to $600). A richly carved Chinese hardwood cabinet featuring deeply carved dragon-motif doors in addition to a highly detailed crest, apron and legs also proved attractive to floor bidders who had previewed in person. Originally assigned a conservative $1500 to $2000 estimate, the cabinet brought $6000 at the block. An intriguing set of seven enameled silver Chinese boxes decorated with flowers, birds and butterflies threw online bidders into a frenzy; due to multiple absentee bids cast online, the lot opened at $6500, well over the $2500 to $3500 estimate, and closed shortly thereafter (price realized: $8125) . Continental works of art saw solid results throughout the evening; a charming, richly illustrative oil painting of a family in an interior with pet pigeons by Italian artist Jules Zermati (1880-1920) earned $4200, well within the $3000 to $5000 estimate. The subject of a hearty bidding war between multiple telephone bidders and a determine floor bidder, “Virgin Crowned by One Angel”, an original engraving by German artist Albrecht Durer (1471-1528) carrying provenance from the Vincent Price Collection, brought $4800, over the $2000 to $3000 estimate. One surprising highlight came in the form of a 19th century Continental school painting of a well-dressed nobleman praying as putti bring him eternal blessings; the unsigned work achieved a $2280 selling price (estimate: $1000 to $1500). A sweet bronze sculpture by Joseph Gustave Cheret (1838-1897 French) depicting a young girl slumbering while her pet cat playfully bats at a lock of her hair was popular with floor buyers, earning $8400 (estimate: $3000 to $5000). An elaborately decorated gilt-bronze German gothic-style cartel clock achieved a $3600 price realized after competition between online and floor bidders (estimate: 2000 to $3000). A highly detailed marble sculpture by Italian master sculptor Guglielmo Pugi (c. 1870-1915 Italian), depicting a beautiful maiden wearing a laurel crown, was a hot-ticket item online, bringing $1875, well over the conservative $600/900 estimate. Always a collector favorite, two KPM plaques were put on offer at Moran’s September 12th sale, including a rectangular plaque after Baron Cuno von bodenhausen (1852-1931 German) titled “The Blind Nydia”; the plaque hammered for $2760, thanks to a collector bidding via telephone (estimate: $1500 to $2500). For more information regarding consignment to upcoming auctions, contact John Moran Auctioneers directly via telephone: (626) 793-1833 or email: info@johnmoran.com.